Deep into family history research last night, I was only dimly aware of thumping sounds from the other room. When I finally surfaced from the 18th century, I found Henry the kitten tearing around the living room wrapped in yarn and dragging my almost fully knit sweater behind him. It was an exciting and stimulating discovery for me, and quite an embarrassment for Henry. All is well once again. Henry was extricated from behind the sofa and the yarn unwound from his back foot. The sweater was fished out from behind the TV, somewhat dusty but miraculously still on the needles. My skein of yarn will never look the same. The knitting bag was locked in the closet for the night and tired little Henry went to sleep with a dreamy little smile on his face. No photos were taken during all the excitement, but here is the untangling process well underway this morning. A colorful project unharmed and just a few more inches to go. Note: Also makes a good dust cloth. This is how we feed them here at the Zee house. Please welcome young Henry (aka Hank, aka Handkerchief), shown here eating on the lower deck. He is an older kitten rescue from the local shelter. From the ASPCA Pet Statistics page: Each year, approximately 1.5 million shelter animals are euthanized (670,000 dogs and 860,000 cats). The number of dogs and cats euthanized in U.S. shelters annually has declined from approximately 2.6 million in 2011. This decline can be partially explained by an increase in the percentage of animals adopted and an increase in the number of stray animals successfully returned to their owners. Our local shelter has worked hard to lower the rate of euthanization and to place their homeless animals into caring homes. They bring dogs available for adoption to many community events, and they have satellite operations around town where cats can be seen up close. It's much more relaxing to look at just a few cats in cages at a pet food store or, in our case, the "Kitty Condo" at our county building, than to go to the shelter. Visiting the shelter is an overwhelmingly emotional experience for me--so many animals, such great need! Bill became acquainted with Henry because he (Bill, not Henry) attends a lot of meetings at the County Building and stopped by the Kitty Condo each time to visit a little kitten called Jupiter (now Henry). Once they were bonded, there was little I could do. Now we are a much livelier household! Plus, we get to live another 18-22 years, the possible life expectancy for a cat. I'm absolutely sure it works that way. I found this photo of the Nepalese Haley Jacket on Ravelry. If you've never heard of it, Ravelry tells us it "is a place for knitters, crocheters, designers, spinners, weavers and dyers to keep track of their yarn, tools, project and pattern information, and look to others for ideas and inspiration." I am fascinated by this garment and have spent a lot of time staring at the photo. The colors! The designs! The techniques! The person who created it, whose Ravelry username is "Rishi," didn't include a pattern but did mention elsewhere that she loves a jacket called Kestrels Alight Kimono, designed by Sarah Swett, and published in the book Knitting in America by Melanie Falick. Our library didn't have the book, but I was lucky enough to find a used copy online for only five dollars. It's a beautiful book, originally sold for $35, but now somewhat out of date. Of course, "out of date" is very subjective, and most of the things in the book appeal to me. Most importantly, I now have some directions for shaping the garment. Phew! Scary stuff, to take a pair of scissors to knitting you have worked on for such a long time! They tell me it works, and I'm going to find out. 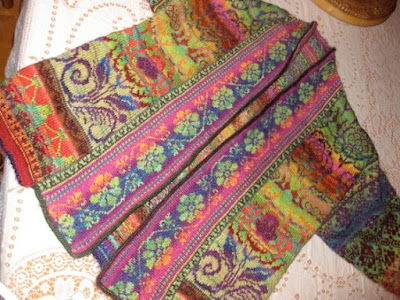 And from what I can tell by enlarging the photo, I think that the front band was knit separately as another tube, short and wide, then cut apart and connected to the jacket body. Another fun steek! Later note: I've found that this band is knitted by picking up stitches from the front, then knit as a tube, etc., instead of being knit separately then attached. I've enjoyed looking through my knitting books for Fair Isle designs to use. 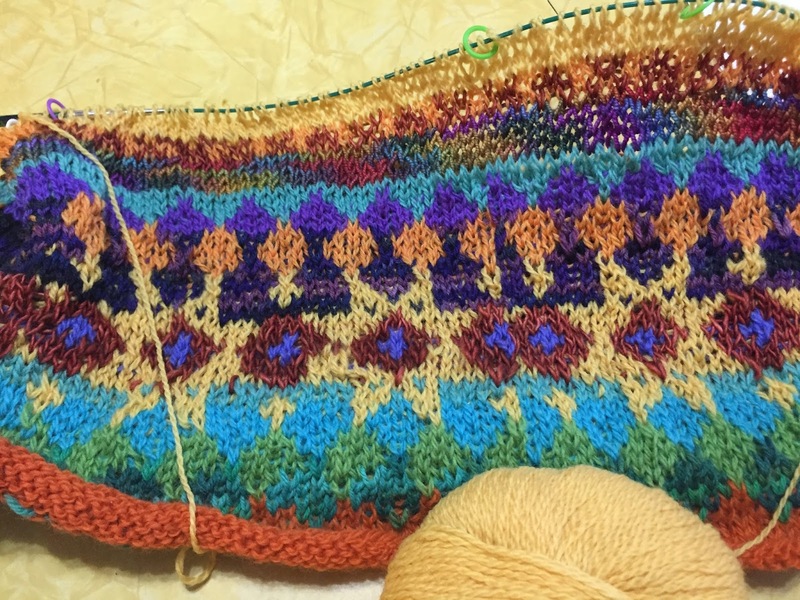 The next section of my sweater will have a flower design that I found online. My printer is disappointing me these days, so I will be spending some time transferring and color coding the blurry online photo to graph paper this afternoon. This is where interpretation of the original inspiration garment comes in. Nothing about my project will look like Rishi's beautiful jacket: My stitches will be much bigger, my colors and designs different, and the finished product will probably be a light sleeveless cardigan vest instead of a warm jacket with sleeves. I've got about six inches knit so far. To get to this point, I needed to knit several swatches so I could determine my gauge and find out how many stitches to put on what size needles. Rishi knitted a dense fabric with tiny No. 2 knitting needles for her jacket; I wanted an airier, thinner fabric (winter in the desert is cold, but not that cold), so I am using much larger No. 8 needles. After figuring out the gauge I began the actual garment, found an error, tore it out. Began again, tore it out again. And again. I'm on my fourth try now and all is going well. Even though it has taken a couple of weeks, I've learned a lot along the way! The jacket at the top of the page took Rishi "about a year to complete." This project is going to be all about the journey, not the destination. Doesn't look much like the inspiration jacket, does it? Funny how that happens.